Many people can become victims of their own success but it appears to have caught up with Declan Rice earlier than most. As a result he is putting himself through – or maybe his advisers are responsible – some testing times at a period of his life when he should be allowed to concentrate on his club career. I’m not sure his international boss Martin O’Neill did him any favours by telling the world he was considering his international position. There are ways of handling these things! It led to Dec having to shrug off ( not easy) a torrent of abus,e notably from Kevin Kilbane. 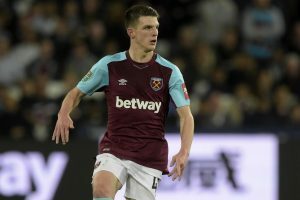 The former Irish international suggested that this may be happening because there was a financial edge in playing for England despite the fact that the teenager has grown up and lived his life in the country. I can understand those who say Dec may be showing a degree of disloyalty but hey, come on, he’s a young guy who has the right to have a change of heart. If there’s any of us who haven’t changed our minds on a change of direction early in our lives we deserve the probably boring job with which we end up. The main thing is however, that despite the controversy surrounding him, the young Iron came out against AFC Wimbledon showing outstanding form which is as much a tribute to his character as ability. Both Manuel Pellegrini and Gareth Southgate have explained there is no way they can advise him but quite honestly I reckon this is a bloke who has all the strength of character to make his own mind up. In the meantime let’s just see him signing a new deal with the club and becoming what we all know he will be – a truly great player.